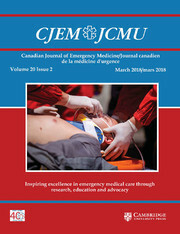 Earlier this month, the Canadian Journal of Emergency Medicine withdrew the retraction after determining the author, Guy Weinberg, had, in fact, provided information about his potential conflict with his initial submission. When we wrote about the retraction in January, Weinberg—a professor of anesthesiology at the University of Illinois College of Medicine in Chicago—said he was surprised to see that his original letter to the editor, which flagged potential flaws in a 2017 paper that reported little benefit from an off-label therapy to treat drug overdoses, didn’t include his potential conflict: Namely, that he is the founder of a company which promotes the use of the therapy to treat drug overdoses. He said he tried to disclose the potential conflict when he submitted the paper in March 2017, but when he couldn’t find the journal’s conflict of interest form, he had “inserted text regarding COI in the appropriate box.” At the time, the journal’s managing editor had told Weinberg that was fine. Several months later, the journal retracted Weinberg’s letter because it lacked his potentially relevant commercial interest. Just last week, the journal appeared to change its mind again. After further review, it was determined that the author had provided potential conflict of interest information with their initial submission, although not in accordance with the accepted forms for disclosure for CJEM authors. The author resubmitted their conflict of interest to the then-Editor-in-Chief, who reviewed the information and determined the retraction was no longer warranted, provided the conflict of interest be clearly noted in the original article. GW is a director, officer, shareholder and paid consultant for ResQ Pharma, Inc.
As explained, the previous EIC ordered the retraction as the commercial COI was not disclosed by the author. Dr Weinberg was fully aware. His revised letter with the COI identified has now been published. Marra noted that the decision to withdraw the retraction was in the works before our coverage of the retraction. After all, it’s only a letter to the editor; but the process has been very frustrating given the lack of transparency on their part and their failure to answer my inquiries.